Principle Six (P6) provides a pathway for everyday people to use our cooperatively owned community institutions to move money into the hands of small, local, and cooperative businesses. We believe that small, local producers are the backbone of healthy and sustainable regional food systems everywhere. We believe cooperatives are a powerful model for creating economies based on equity, democracy, and community-based economic development here, nationally and internationally. Through P6, we’re re-investing in the work grocery co-ops across the country have been doing for the last 30 years, which is building social justice and sustainability in the food system. Co-ops built the natural and organic marketplace, but over time incredible consolidation has occurred in our food system. Large corporations now own, control, and profit from a vast percentage of the natural and organic food industry. P6 examines ownership and control and redirects profit to producers who create the kind of food system we want to support by focusing on small, local, cooperative producers. Let’s take a step back and think about what co-ops actually are. For a certain subset of people, co-ops are hippie grocery stores, where you get your bulk granola and organic greens, but there’s so much more to cooperation! Co-op grocery stores have moved beyond that image and are successful, professional businesses open to everyone. Also, co-ops exist in every sector, well beyond grocery alone. A cooperative is, at its most basic, a business that is owned and controlled by the people who use and/or provide its products and services. Those people can be its customers (as in most grocery co-ops), its workers (as in worker co-ops like Rainbow Grocery and Si Se Puede cleaning co-op), or its producers (as in farmers co-ops like Wisconsin Growers Co-op and APRAINORES cashew Co-op). Any type of business can be a cooperative, from electric utilities to bike shops to bakeries and farms to natural food stores. The differing interpretations and methods through which these principles are implemented from co-op to co-op means it can be hard to make blanket statements about all cooperatives. 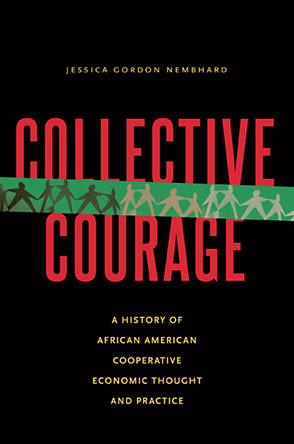 For example, “democratic member control” at a small worker co-op may mean that every worker needs to be present before an important decision can be made through a consensus process--or it may mean that every one of over a million members at a national retail co-op has an opportunity to vote by ballot for the board of directors if they so choose. At P6, we are putting the sixth cooperative principle, “cooperation among cooperatives”, into action. At the core, we work to promote an economic system that operates according to the cooperative values: one where we are able to choose how to earn our livelihoods, where we have power over our financial lives, and where we are able to make decisions that allow others to do the same. Co-ops are a key tool for community wealth-building because they are self-help organizations. People find places where a need is going unfilled in their community, whether it’s a need for jobs with dignity, for electricity, for healthy food, or for a distribution network. The electrification of rural America could not have taken place without the formation of rural electric cooperatives, started by people who were meeting their own needs when big corporations said bringing them service wasn’t worth it (more information). Coffee growers across Latin America and Africa fight back against plantations and unfair wages by owning coffee farms and accessing markets cooperatively. In many communities across the country, people in the 1960s and 1970s bulk ordered foods like brown rice and whole wheat flour and sold them at cost to their neighbors off their back porches. Some of those bulk-buying groups turned into food cooperatives, filling a need in those communities for access to healthy food. Since that time, many other grocery stores have followed the lead of food cooperatives and started providing organic, fair trade, and “natural” options. While there are unquestionably positives of the broadening appeal of these products, the terms also become weakened by being broadly applied. 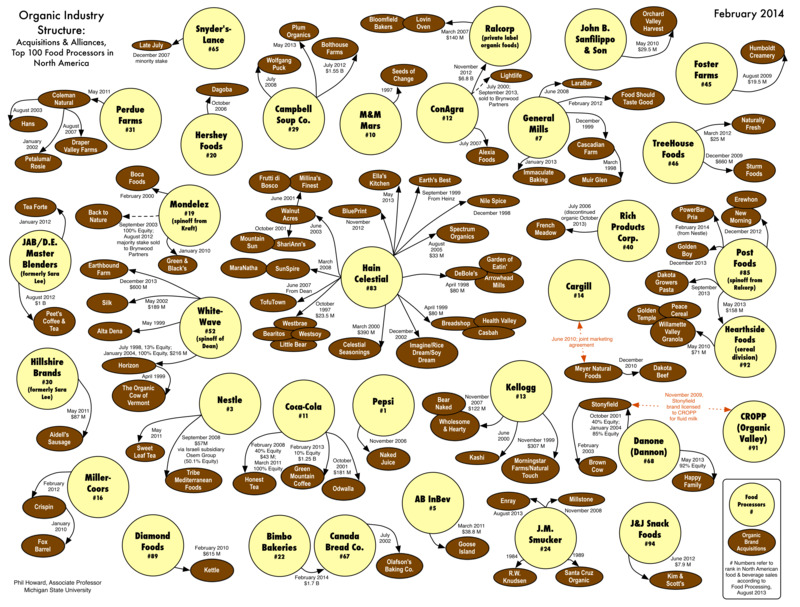 This chart shows the top 100 organic brands in the country, the overwhelming majority of which are owned by the same companies who run the rest of the food system. P6 emerged to fill a need felt among grocery co-ops to find a way to distinguish our cooperative values from others who are picking up the work co-ops started to promote natural foods. There is often a perception that sustainable and small, organic and local go hand in hand. As the “Who Owns Organic?” chart shows, buying organic doesn’t necessarily build a more fair or, in reality, sustainable economy. Labels like “organic” or “fair trade” that function at a national or international level are extremely important. The federally regulated standards for “organic” ensure that your carrot was grown without synthetic pesticides whether you buy it at the corner store, at the superstore, or from your farmer. P6 adds something else: accountability for the economic impact of your purchase. Every product labeled P6 at your co-op is researched by the workers at that store who share your values for supporting small, local, and cooperative producers. The definitions of each criteria are customized to meet the specific needs of each store – for example, local looks different in Arkansas than in Minnesota. The P6 program provides a co-op peer network where grocery co-ops and cooperative producers share resources and ideas. Additionally, P6 co-ops are finding other ways to build on the value of cooperation among cooperatives. Equal Exchange is hosting a program called Grow Together to help a specific cashew farmers cooperative called APRAINORES Co-op. P6 members Seward and Eastside are both participating and dedicating $0.50 per pound of cashews sold to help these farmers rebuild. In Indiana, P6 member Bloomingfoods is part of a cross-sector cooperative collaboration with the local cooperative electric utility and credit union. There are many great examples of producers that get the P6 label. Rochdale Farms in Wisconsin is a cooperative of dairy processors making yogurt, butter, and cheese that sell together under one label and buy milk from small farmers. Equal Exchange, which founded the P6 program originally, is a worker cooperative that buys coffee, chocolate, and other international goods from cooperative farmers. P6 also includes the kind of local family farms co-op shoppers often seek to support, including new farms like Villines Family Farms in Arkansas and long-standing farmers like Bud Smith, who has been growing melons in Indiana for 80 years. The cooperative tradition is a long and proud one. Cooperative grocery stores have worked to advance the natural foods movement while providing a day-to-day example of cooperative economics to communities around the country. P6 is a next step, bringing our cooperative values beyond our store structures and into our purchases. We’re raising awareness of food economics to the surface and helping stores set goals to do more sourcing from P6 producers, creating a real economic impact. For example, in 2014, 40% of total store sales at P6 member Seward Co-op went to P6 producers, meaning $13.2 million in sales of small, local, cooperative products. P6 is about more than changing spending patterns. P6 is about building relationships, re-creating networks, developing new supply chains, exploring ingredient sourcing, opening deeper conversations, and searching out the untold stories in our food system. P6 is about participation and encouraging customers, producers, and co-op staff to consider how their daily decisions can change the food system we build together. To learn more about P6, visit our website at p6.coop. You can reach out to our National Director, Aaron Reser, at aaron@p6.coop to receive more information about how to get involved. Ruby Levine is the Marketing and Communications Contractor for P6. Based in Minneapolis, her vision for the future is grounded in economic community empowerment and anti-racism. Before coming to P6, she has worked with Grand Aspirations and CoFED.